If you don’t know who Pat Vellner is than you haven’t been following CrossFit for the last 3 years. Pat has come 3rd, 3rd and 2nd at the CrossFit games in the last 3 years making him the most dominant Male CrossFitter not named Mat Fraser. What’;s even better is he’s a good ol Canadian boy from Ontario. Yesterday I watched an interview that Pat did with a popular Youtubber Craig Richey. The interview was great but the thing that caught my attention the most was when he was talking about his approach to day to day training. Now I’ve given this talk to my competitive athletes a couple of times already and it’s something that I really believe to be true, when the worlds 2nd fittest man agrees with my opinion than I know I’m right on this one lol. Training vs. 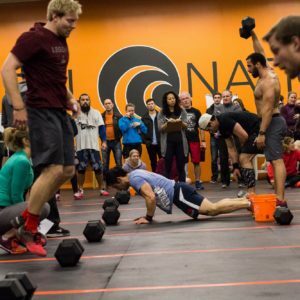 Competing in CrossFit is one of the hardest concepts for crossfitters to grasp, there is a big difference between training and competing but in CrossFit more than any other “sport” this concept and this line gets really blurry because I know that people come in everyday and compete, compete against themselves, compete against others. It doesn’t matter, when you’re competing the mindset is different than when you train. When you train your focus should be on perfecting your craft, moving better, with better efficiency. The time on the board means a lot less because you’re moving with purpose and having an intent to increase good movement when your tired, that will never be your best time. When you compete you go at it with everything you have to win and you’ll comprimise other things to try and win. These are two totally different mindsets and the body perceives them very differently. Competing is way more stressful and has a way higher response on the CNS that causes a lot more fatigue and possibility for injury as well as taking a longer time to recover from, when we train the pace slows down, the movement quality is better and we’re focusing on moving to the best of our ability, this is less stressful and a lot easier to recover from. We can’t compete everyday without running the risk of injury and burnout we must learn to train and compete on competition day. We must learn to move better and more efficient and on comp day wwe make it rain. Your body will love you for it and you’ll be way better off. The question is can you leave your EGO at the door and be ok with not having the fastest time on the whiteboard? That’s the hardest part. Train on a daily basis, compete once in a while to test yourself and find weaknesses then go back to training, you’ll be way better off!